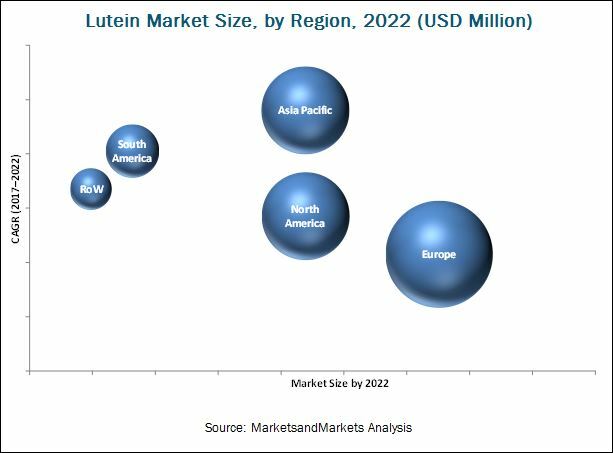 [124 Pages Report] The lutein market was valued at USD 249.7 Million in 2016 and is projected to reach USD 357.7 Million by 2022, growing at a CAGR of 6.3% from 2017, in terms of value. In terms of volume, the market is projected to reach 2,121.2 tons by 2022. The objectives of this study are to define, segment, and project the size of the lutein market based on form, application, source, and key regions. This report includes the estimation of the market size for value (USD million) and volume (tons). Both, top-down and bottom-up approaches have been used to estimate and validate the size of the lutein market and to estimate the size of various other dependent submarkets in the overall market. Key players in the market have been identified through secondary research (the FAO, Bloomberg Businessweek, Factiva, and companies’ annual reports), and their market share has been determined through primary and secondary research. All percentage shares, splits, and breakdowns have been determined using secondary sources and verified through primary sources. The various contributors involved in the value chain of lutein include manufacturers, suppliers, distributors, intermediaries, and customers. The key players in the lutein market include BASF (Germany), Chr. Hansen (Denmark), E.I.D. Parry (India), Kemin (US), and Zhejiang Medicine (China). Other significant players include DDW The Color House. (US), Döhler (Germany), Lycored (Israel), PIVEG (US), Allied Biotech (Taiwan), and FENCHEM (China). The lutein market is estimated to reach USD 263.8 Million by 2017 and is projected to reach USD 357.7 Million by 2022, at a CAGR of 6.3% from 2017. In terms of volume, the market is projected to reach 2,121.2 tons by 2022. The lutein market has been largely driven by the growing demand for lutein in the dietary supplements market. Lutein is mainly used for preventing eye diseases such as AMD and cataract. Companies are currently focusing on the application of lutein in food and beverages, as well as personal care products. The dietary supplements segment is estimated to dominate the lutein market through the forecast period. Dietary supplements is an important segment of the lutein market as lutein is mainly associated with eye health and is increasingly used as an ingredient in eye health supplements. Many reports and researchers are highlighting eye health benefits with the consumption of lutein, such as reduction of risk or slower progression of eye diseases such as age-related macular diseases (AMD) and cataract. The synthetic segment is estimated to dominate the lutein market in terms of value, as the synthetic production of lutein is more economical for the manufacturers. However, the growing awareness about the benefits of natural lutein and increased health consciousness among the people is leading to increased spending on high-quality products, owing to which the market for natural lutein is projected to grow at a higher CAGR over the next five years. The European region dominated the lutein market in 2016 and is projected to grow at a moderate CAGR from 2017 to 2022, in terms of both value and volume. The presence of leading lutein manufacturers who operate on a global level and the stringent norms related to the use of synthetic ingredients laid down by the EU drive the demand for naturally source lutein in the region. Thus, the use of lutein for human consumption has recently started developing due to the increasing awareness about the advantages of carotenoid consumption. This increased use of lutein in pharmaceuticals, animal feed, medicine, and human food drives the growth of the lutein market in Europe. In the Asia Pacific region, India is projected to be the fastest-growing market. The changing lifestyle and preferences, increasing awareness regarding the benefits of lutein, the growth of the health-conscious population, higher disposable incomes, and growth of the middle-class population are some of the factors driving the growth of the lutein market in India. India has a varied agricultural climate, relatively inexpensive labor, and according to the FAOSTAT, it has the second-largest population in the world. Some of the major producers of lutein in India include Synthite Industries (India), OmniActive (India), and E.I.D. Parry (India) that serve lutein products in the form of oil suspensions, beadlets, powder, and paste for use in human health supplements and animal nutrition. The beadlet and emulsion form segments are expected to witness high growth during the forecast period. The growth can be attributed to the growing novel compounding techniques and microencapsulated techniques to improve the stability, solubility, and bioavailability of lutein. With the rising technological advancements, manufacturers in the lutein industry are now focusing on a broader field of applications. The lutein market is concentrated, with leading companies driving market growth. The report provides qualitative analysis of the prominent market players and their preferred development strategies. Key players such as BASF (Germany), Chr. Hansen (Denmark), E.I.D. Parry (India), Kemin (US), OmniActive (India), and Zhejiang Medicine (China) have been profiled in the report. These leading players have adopted various strategies such as expansions, acquisitions, new product launches, and joint ventures/partnerships/collaborations to explore new and untapped markets, expanding in local areas of emerging markets, and developing a new customer base for long-term client relationships. 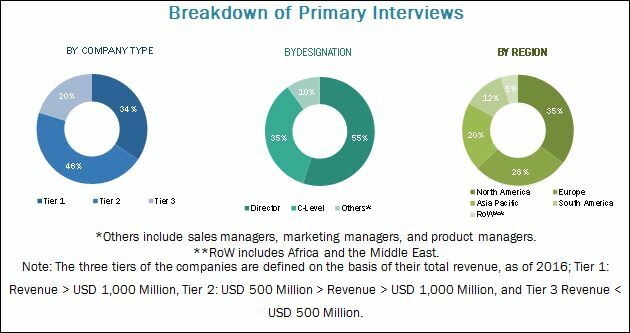 This has not only enabled the key players to expand their geographical reach but has also reinforced their market position by gaining a larger share in terms of revenue and product portfolios.